ARToberfest: tickets for sale, volunteers needed! 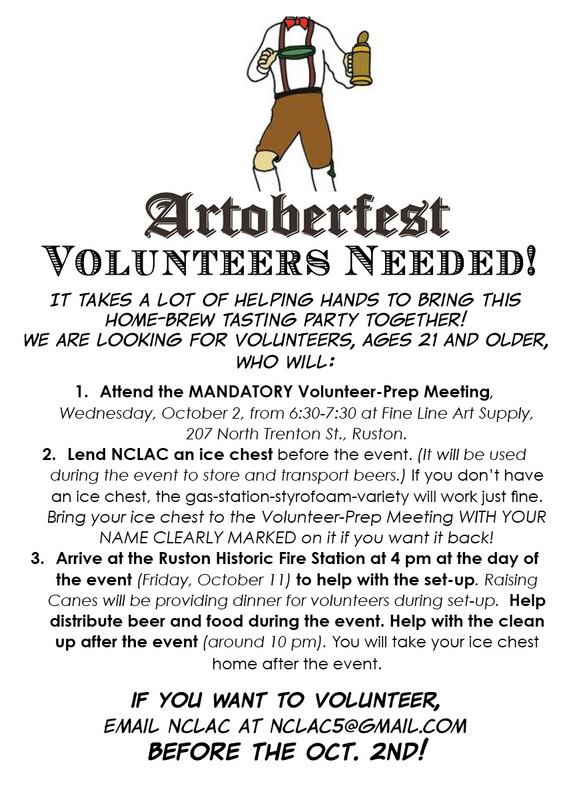 Fall is here and so is NCLAC's 4th Annual ARToberfest! This event celebrates a variety of styles of beer, from regional home brews to Marsala Beverage’s finest. The home brew tastings are a highlight of the night, with good, healthy competition and handsome awards for the winners.This event raises funds for the NCLAC Holiday Arts Tour, scheduled for November 21-24. ARToberfest 2013 will take place at Ruston’s Historic Firestation from 5-9 p.m. on Friday, Oct. 11. Beers, live music and tasty food will make the evening a night to remember. We will have the perfect pint glass available for sale again this year, as well as a small batch of tshirts! The raffle will be new and improved, with cool packages to help you experience Ruston like never before. Christiane Drieling and Bonnie Ferguson will be back with their wares, and the music line-up will have some ARToberfest favorites, as well as some new acts. ARToberfest is sponsored this year by Louisiana Campaign for Tobacco-Free Living and Marsala Beverage, with “Devine Home Brewer” awards sponsored by Devine Wines and Spirits. The Bar Snack tables this year will be donated by Chris Turner and Super One Foods. For the volunteers and bands, Josh Shirley and Raising Cane's will be providing food. ARToberfest ticket options are as follows: $35 VIP admission, 5:00pm entry, catered dinner by Ben Christmas, and a commemorative pint glass; $15 general admission, 6:30pm entry, bar snacks. All attendees can enjoy live music and beer tastings. There is a limited quantity of tickets, and they are available at the Dixie Center for the Arts and Fine Line Art Supply; they can not be sold at the door. Call (318)255-1450 for more information. No one under the age of 21 will be allowed at the event. Now, if this sounds like a fun event to you, and something you'd like to help out with, we need volunteers to put on this party! Volunteers assist with pouring beers and serving food, as well as set-up and clean-up. There is a mandatory volunteer meeting on Wednesday, October 2 at 6:30 at Fine Line Art Supply, 207 N Trenton. At this meeting, we'll discuss the run-down for the night of the event. We ask that you bring an ice chest, clearly marked with your name, to the volunteer meeting. We'll return it to you after clean-up on the 11th. A styrofoam-gas-station-variety cooler will work just fine. Volunteers will be expected to arrive by 4pm at the Historic Fire Station on October 11, and to stay through clean-up, which should end around 10pm. All volunteers must be at least 21. If this sounds like a commitment you're ready to make (trust me, it's fun!) then please email us at nclac5@gmail.com so we know to expect you at the meeting. There are a limited number of volunteer positions available.